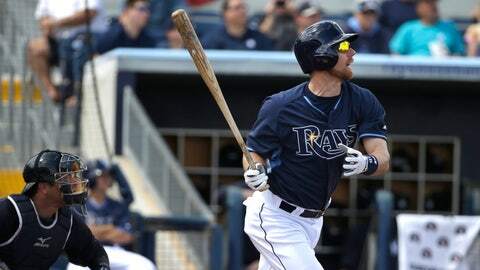 Ben Zobrist watches his first-inning home run during the Rays' 5-4 spring training win on Wednesday afternoon. PORT CHARLOTTE, Fla. (AP) — Ben Zobrist, Desmond Jennings and Matt Joyce homered to help the Tampa Bay Rays beat the New York Yankees 5-4 on Wednesday. Cesar Ramos allowed two runs in 2 1-3 innings as he entered the competition for the fifth spot in the Rays’ pitching rotation. Newly acquired closer Grant Balfour gave up a pair of fourth-inning runs in his second spring appearance. New York’s travel roster included few notable names after playing the previous night in Tampa, with Ichiro Suzuki getting a start in center field and Eduardo Nunez getting a look at second base as manager Joe Girardi continues to explore the infielder’s versatility. "We’ve got to move him around because he’s in that competition, playing second and third. … "Defensively, you’ve got to be able to handle a couple of different spots," Girardi said. "He’s played mostly at shortstop. But because of the situation we’re in, he’s got to be able to move around." Adam Warren, a candidate to be the Yankees’ fifth starter, allowed one run and four hits in 2.1 innings. Zobrist hit a leadoff homer in the first inning. Jennings and Joyce went deep in the fifth against Robert Coello, with Jennings delivering a three-run shot that made it 4-all and Joyce breaking the tie. Yankees: Warren is trying to win a spot in the rotation appearing in 34 games last season, 32 in relief. He settled after giving up the homer to Zobrist and struck out two. Rays: Ramos worked exclusively out of the bullpen for the Rays in 2013, and has joined Erick Bedard and Jake Odorizzi, who both also pitched Wednesday, in the competition for fill in for injured fifth starter Jeremy Hellickson, who is expected to miss the first six to eight weeks of the season after undergoing elbow surgery. Bedard allowed three hits, walked one and struck out two in three scoreless innings. Odorizzi yielded two hits during a scoreless ninth. Yankees first baseman Mark Teixeira (wrist) and outfielder Alfonso Soriano (flulike symptoms) are expected to return for Thursday’s game against the Phillies in Clearwater. Teixeira was limited to 15 games because of injury last season, batting .151 with three homers and 12 RBIs. He understandably is excited about getting back on the field this spring. "When these guys are used to playing every day and you take their livelihood away from them for basically a year, it’s tough on them," Girardi said. "I’m looking forward to seeing him out there. We really missed him last year." Yankees right-hander Masahiro Tanaka will make his first start — and second spring appearance overall — on Thursday. He worked two scoreless innings against the Phillies in Tampa last Saturday and is looking forward to facing a lineup likely to include more front-line players than he encountered in his debut. "It’s an opportunity to see what he needs to do, what he feels he needs to do to be successful over here," Girardi said. "He’s had a ton of success in Japan, and they want to make adjustments just like anyone else." Thursday’s game will be the first opportunity for the Yankees to test baseball’s expanded instant replay system. "I think it’s going to be good. Are there some kinks that are going to have to be worked out? Sure, just like anything else. But I think it’s going to be good for baseball," Girardi said. The Yankees skipper said he won’t enter the game with a specific plan to challenge a call, although he’s curious to see how things will play out. "We’ll practice it. We’ll have someone in the clubhouse watching it on TV, but he’s basically going to get one or two angles (to view), where at home he’ll get 12. We’ll use walkie-talkies and try to do the best we can to practice. But I don’t think you are really going to be able to practice until you get home" and have all the available views to examine calls. 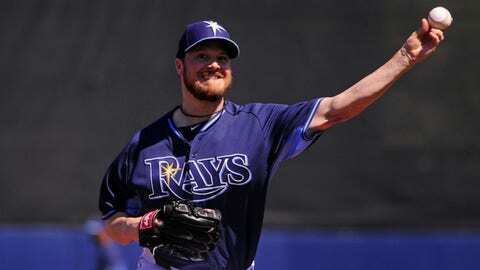 The Rays’ first exposure to expanded replay comes Friday vs. the Blue Jays in Dunedin.